We've all grown used to ordinary customer experiences, so when something extraordinary happens, we pay attention. 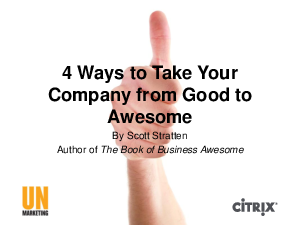 No matter whether your business is a one-person show just getting started or a multi-national corporation, whether you are a front-line worker or a top-level executive, you can create awesome. This brief by Scott Stratten, best-selling author and president of UnMarketing, shares stories that’ll inspire you to find your own unique brand of business awesome.